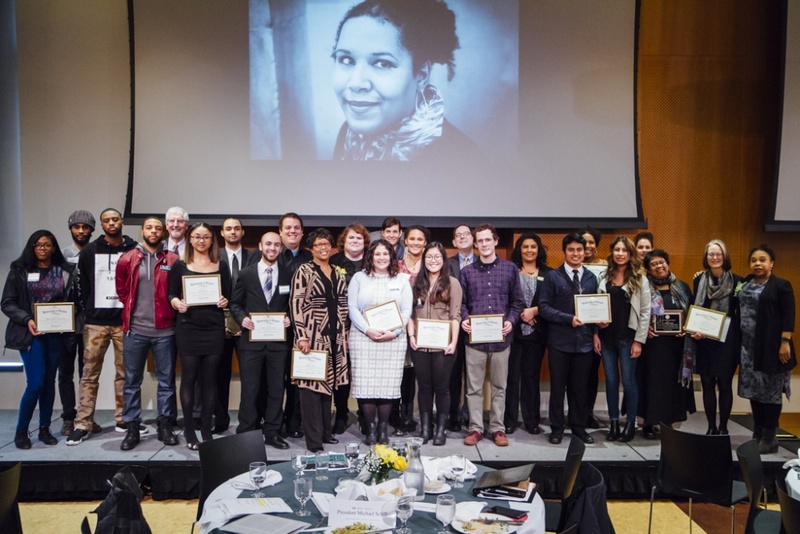 Nine individuals and seven groups have received the UO’s Martin Luther King Jr. Award for their efforts to spark changes that help bring about the civil rights leader’s vision of a more just and tolerant community. The recipients were honored at the annual awards lunch Jan. 18, along with campus leaders and contributors who were nominated for the awards. More than 200 people attended the event in the Ford Alumni Center’s Giustina Ballroom. Yvette Alex-Assensoh, the UO’s vice president for equity and inclusion, said the awards recognize people and programs who understand that lasting change doesn’t come by celebrating a single holiday like MLK Day but by making his ideals part of every day. She said the UO recipients have done just that. “Through persistence and determination, these people have left an impact on this university that will be felt long after they’ve moved on from the UO,” she said. Karen Ford, professor and associate dean of the College of Arts and Sciences: Ford infuses diversity and equity into all elements of her work. This includes years of mentoring and providing support for faculty women of color, creating the English Department Diversity Committee and the Postdoctoral Fellowship in Ethnic American Literature and Cultural Productions, and playing an instrumental role in developing the IDEAL framework. Most recently, she worked with the Black Student Task Force and the dean of the College of Arts and Sciences to lay the framework for hiring African-American faculty in history, women’s and gender studies, and English. Sangita Gopal, associate professor of English: Gopal has made major contributions in the areas of institution building and facilitating retention of women of color. As the chair of UO Women of Color Project, she works to increase membership and activity. She has built a reputation for transparent and democratic leadership. As a result of this leadership, the Women of Color Project has helped almost 30 women cope, excel, and thrive on campus. MEChA: Recognized for its advocacy for immigration rights and work with Deferred Action for Childhood Arrival students. Their leadership played a major role in ensuring the UO is a sanctuary campus where undocumented students can feel safe and get the most out of their college experience. Black Student Task Force: Recognized for its contributions to combating anti-black racism on campus. In late 2015, the task force led protests against racism at the UO and followed that up with the creation of a list of demands. Their 12 demands highlighted a variety of ways in which the UO could better serve its Black students. As they continue to work with UO administrators, the task force serves as a model for effective advocacy, both in the spotlight and behind the scenes. Native American Student Union and Native American Law Students Association: Recognized for raising awareness on the Dakota Access Pipeline and the protests surrounding it. The groups participated in the movement to stop the pipeline at various levels, including hosting panel discussions, raising money to support the protesters and traveling to North Dakota to join the protests themselves. The Muslim Student Association, Arab Student Union and Oregon Hillel Foundation: Recognized for starting and sustaining the Manzil Midrash/ Conflict Series. This series of conversations is providing a constructive atmosphere where members of these two faith groups are interacting consistently as they seek to share what is common in their faiths as well as have respectful conversations about their differences. Erik Girvan, assistant professor of law: Recognized for his contributions to improving the faculty search process. Girvan’s research on implicit bias has awakened many to the nuances of discrimination and inequity. By facilitating implicit bias trainings for hiring groups at the UO, he helps his colleagues recognize subconscious biases and helps prevent them from influencing their decisions. Aleiya A. Evison: Recognized for her contributions in the area of ethnic studies. Her analysis of the policies and systems that create disparities in education is especially important in the current political climate. By looking at the root causes of the racialization of education, she has helped move the conversation forward. Bethany Grace Howe: Recognized for contributions in the area of journalism. As a nationally published writer, Howe has been a strong voice for LGBT issues, especially transgender equality. She has also served on various university diversity committees, helping to raise awareness and build the programs and spaces necessary for a more equitable and inclusive UO. Kena E. Gomalo: Recognized for both his scholarship and student activism. His research on race and the U.S. Supreme Court brings important attention to institutional inequity at the highest levels of power and influence. However, he is probably best known for being a founding member and prominent voice for the Black Student Task Force as well as for his work with the Conflict Resolution Program at UO Law. Rachel Mallinga: Recognized for her advocacy and the creation of the Planning, Public Policy and Management Peer Exchange. As a graduate student in the program, she has helped bring in numerous speakers to campus, including Angela Davis. She also works to fight food insecurity as a member of the Willamette Food and Farm Coalition board. Brianna Hayes: Recognized for her work with the Black Women of Achievement and the Black Student Union. During her time on campus, she has led transformation both on an individual and institutional level. She has been instrumental in launching several initiatives to raise awareness about social justice and equity. Elirissia P. Hui: Recognized for her contributions to advocacy and retention for the UO’s Asian Pacific Islander community. As co-chair of the Asian, Desi, and Pacific Islander Strategies Interest Group she has played a crucial role in growing and mobilizing membership. She also serves on the American Student Union and the UO Wushu Club.